If you took the topiaries of Paris, France, added the architecture of Santorini, Greece, and gave it the citrus sky pastel riot of colour that reigns in Mexico, you would have Guanajuato, Mexico. Throw in crazy markets, a hundred mummies, enormous golden cathedrals with red domes and silver altars, a gorgeous theatre, and enough winding narrow cobblestone streets to make a European hill town blush. Amazing! Colourful. Also there exists a cacophony of competing neighbourhood canine chorales. The performances are frequent and always start with a soloist who initiates the overture in the classic call and response form. The full chorus quickly joins in, rising to a crescendo, only to be joined in by soloists from other barrios, who quickly are supported by their own choirs. They cyclically whip each other in a frenzy all through the night and do their best to drown out the roosters in the morning. The guard dog chorales . These dogs careen unexpectedly against gates as we walk by, or watch from rooftops Finn’s every move, growling and gnashing. The only thing that stops these Pit Bullesque monsters is the distance to the ground. This is unnerving when they are only a few feet above your head. Finn looked straight ahead and refused to give them the time of day. Guanajuato should be seen by everyone, at least once in their live. It is fun, lively, romantic and beautiful. We left this morning and found another amazing cathedral with an ornate facade featuring what must of been thousands of faces. Angels, Saints, cherubim, serpents and Aztec looking demons stared down at us. The faithful prayed inside, which was also full of ornate visages. 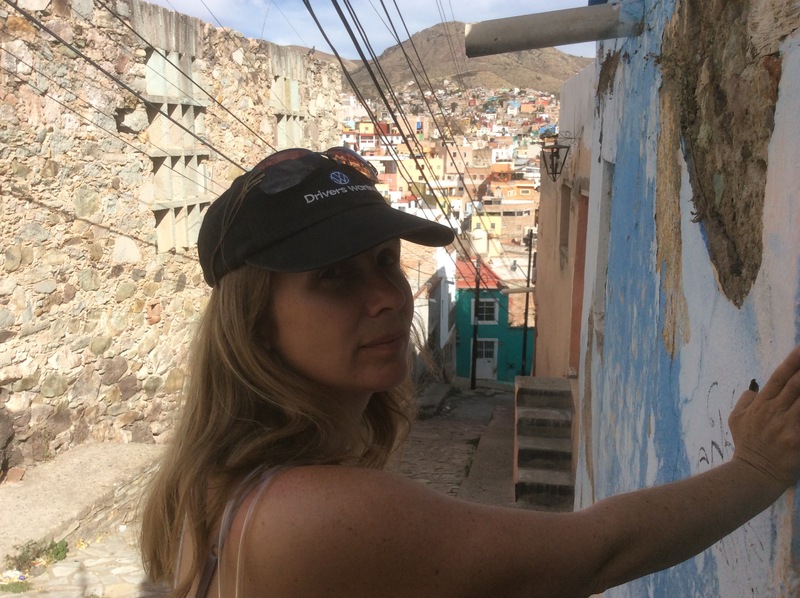 Onward to San Miguel de Allende, where I am writing this. Another opulent, albeit considerably smaller Mexican city. We arrived here today after a thrillingly twisty drive through the mountains. We tried to navigate to the free camping, but instead ended up in an unbelievable hostel, where we have basically paid to park under a variety of citrus trees in a Colonial courtyard. We have full access to the place. The owner’s two children talked to us as a pretence to get to the dog. Pop-tarting here is like camping in the garden of Eden. In fact, a cathedral is on the other side of the stone garden . It was a day of two Mexican weddings. The first at our cathedral. People were lined in the street, waiting for the newlyweds to emerge. Family waited on the marble landing. Suddenly, the abuela (Grandmother) collapses! Family rush around and from a distance, it looks serious. The scene continued for several minutes, apparently unbeknownst to the bride and groom, who emerged to the hesitant pelting of rice and the blowing of soap bubbles. The bride realizes that something is amiss and goes to the elderly woman, the groom lights a cigarette and glad hands his buddies. Little boys are kicking a soccer ball to each other in the square below. Finally, the group around the collapsed grandmother begin to stand. The bride, weeping, kneels in front of the old lady, who blesses her. A flock of grey pigeons, with two white ones, circled the bell tower three times, then landed on it. Quite a scene. As a foot note, I can hear the reception party as I write this. The other wedding took place in the centre of town in one of the most spectacular cathedrals I have ever seen or been in. Situated on the main public square, surrounded by unbelievable topiaries, fine restaurants and family night life, this cathedral was to be our third major church today. As we approached the entrance, we noticed the portal surrounded by men and women in some of the nicest, and surely most expensive, outfits we’ve ever seen. A quick peek I made it obvious that a wedding was about to happen. 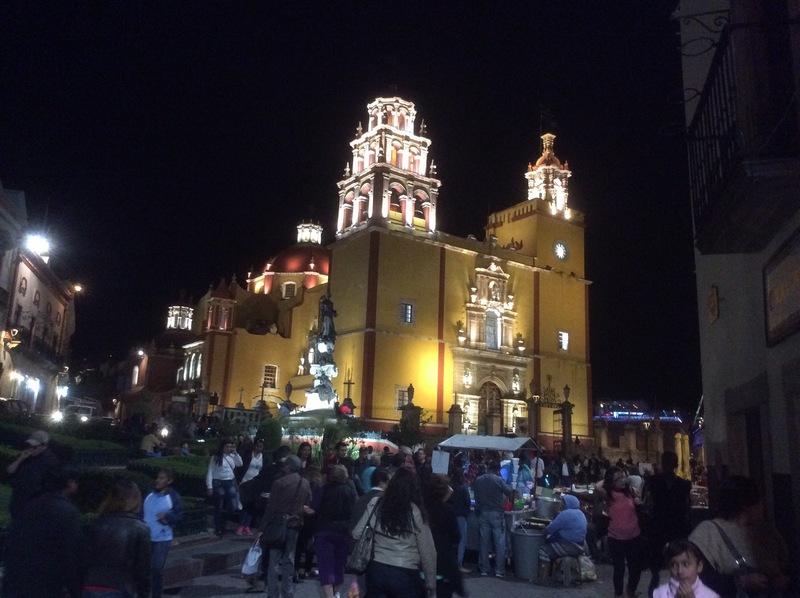 The plaza outside the church was full of evening revellers of the family sort while traditional Mexican bands competed for their attention. Two fourteen foot puppets, representing the bride and groom, circulated through the crowd. An expensive white sedan with the bride in it waited. The cathedral bells peeled and the guests entered the cathedral. Finn entertained the locals. That’s when I noticed the security detail. Burly men with ear sets in suits were lining the steps. They were following the bride and the man with her – her father. Cameras clicked and a drone camera hovered over the father and bride as they made their way. I approached the guard and used my best broken Spanish. Finn, unimpressed, continued on his quest to set a new record for being petted by strangers in a single evening. Entertaining and dreamlike!And Finn never wavers. Previous Previous post: Feliz Cumpleanos!!! !